Madeleine is a recent doctoral graduate of the MGH Institute of Health Professions and currently practices as an inpatient physical therapist in Roslindale. A horse lover who started riding at the age of 5, Madeleine began her Lovelane journey as a Sunday volunteer in February of 2015 and quickly fell back in love with the world of therapeutic riding: a passion which she had first been introduced to as a teenager in upstate New York. 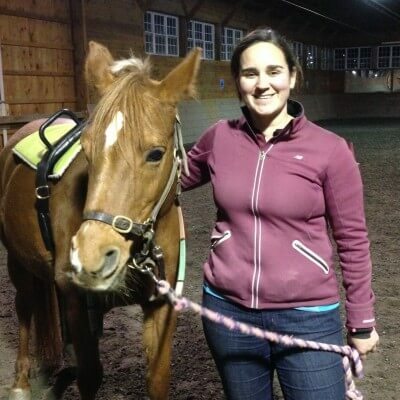 After renewing her Massachusetts teaching license that she had held for years running a riding camp in the Berkshires, she joined the instructor team part time in September 2015. Madeleine loves the way that Lovelane riders, many of whom have spent a lot of time in traditional therapy, can reap the physical and cognitive benefits of horseback riding, without feeling like a patient. It is possible to have a ton of fun in lessons, provide beneficial therapies, and still give children the chance to just be children and riders.